Oh here's a new comic from Blogcomics.net that I thought that I would share. 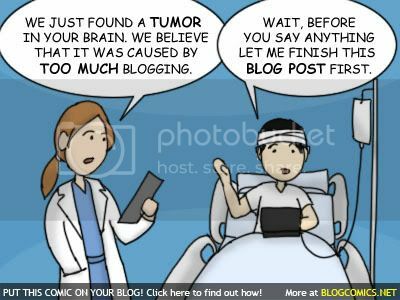 Although it's highly impossible for a person to get a tumor from too much blogging it is funny to take note though that the patient is more concerned of his blog than his own health. Well, I may also be guilty of this being a blog-a-holic myself. I sometimes get a distended bladder because I have to finish posting first or blog hopping and all that bloggy stuff. I'm so hooked to blogging that I don't seem to notice time fly. How I hate it when there's so many things to blog and there's so little time. But I was thinking if blogging was declared as dangerous to my health I wonder if I would stop? Well maybe I will but if not then let the addiction and fun continue hehehe.